This lesson can be used as a pre-lesson for the Read and Retell a Classic!Lesson plan. Students will retell a fictional text using a paragraph frame. Students will be able to retell a fictional text with transition words using a paragraph frame. Access prior knowledge of comprehension by showing a photograph of someone understanding what they are reading. Write the word "comprehension" under the photograph. Ask students what the picture shows and how the picture relates to the word comprehension. Allow a few students to offer responses. Explain to students that comprehension means understanding what you are looking at, reading, or discussing. Explain to the students that today they will be learning unfamiliar words, transition words, and using a paragraph frame to help them retell a story. Have the students choral chant the learning objective for the day: "I can retell a fictional text with transition words using a paragraph frame." 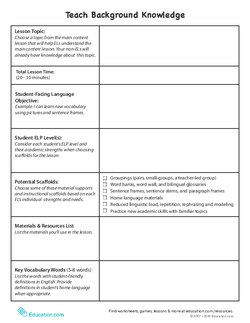 Put students in small groups and pass out the Vocabulary Cards worksheet. Words they don't know or have never heard before. Words they have heard of but can't define or use in a sentence. Words they can accurately use in writing or speaking. Give students about five minutes to sort the cards and discuss their answers before calling on students to share their responses. Clarify the meaning of each tier word by modeling sentences, and use the pictures on the flashcard as a reference. Explain that these words will be in the story they will be reading today. Ask the students to keep the flash cards out to use as a reference for the rest of the lesson. Explain to students that transition words are the words that signal the order of events. They let you know what is happening first, second, third, and so on. There are many different options that show the transition from one thought to the next. Pick out a few sentences from The Ugly Duckling's New Friend worksheet that include transition words and write them on the board. Read one of the sentences aloud, stopping when you get to the transition words. For example, say, "The words once upon a time help us know when the story takes place. These words are transition words. Just as I explained before, transition words are words that signal the order of events. Throughout the story you will read, there are many transition phrases." Put students in pairs and ask them to write down the remainder of the sentences on whiteboards, circling the transition words. Allow students to share their responses and clarify any confusion. 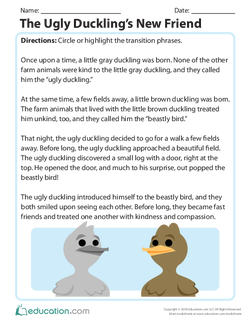 Project and pass out copies of The Ugly Duckling's New Friend worksheet, and read the story aloud as a whole group. Explain to students that just like transition words help us to understand what happens first, second, third, etc., paragraph frames are tools that can help us retell and understand what we are reading. Ask the students to stand up and repeat the following phrase while clapping to the number of syllables per word (for example, students will clap three times for the word paragraph): "Paragraph frames are a tool to help me comprehend". The story is about a ____. Explain that they will take turns retelling the story, using the paragraph frame as a tool to help. Ask the students to scramble throughout the room. Say, "Go," and ask students to find a partner. Use the Formative Assessment: Fictional Text Retell Checklist to takes notes about the students' accuracy and clarity when retelling the story using the projected paragraph frame prompt. Continue this process until each student has discussed with at least two partners. 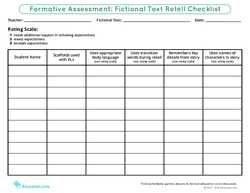 Make note of students who are still confused on the Formative Assessment: Fictional Text Retell Checklist. Provide beginning ELs with home language support and instructions. Pair beginning ELs with sympathetic non-ELs. 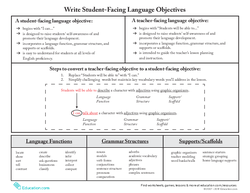 Encourage ELs to use visuals of the vocabulary and paragraph frames in their discussions. Allow students to retell the story in their L1 during the discourse activity. Allow students to draw pictures, sequencing the story, during the formative assessment. Encourage students to orally retell the story during the discourse activity without the paragraph frame. Ask students to write a short paragraph as their formative assessment without using the paragraph frame. Encourage students to use transition words (first, next, then, last) in their paragraph. 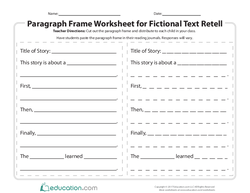 Have students form small groups and distribute the Paragraph Frame for Fictional Text Retell worksheet. Ask students to paste the paragraph frame in their reading logs or journals. Reiterate to students that paragraph frames are tools that can help us retell and understand what we are reading. Next, explain to students that they will work independently to fill out the paragraph frame worksheet in their reading logs or journals, retelling what happened in The Ugly Duckling's New Friend. Walk around and take note of students who are struggling to finish the sentences accurately and those who are able. Once students are settled back at their seats, have them stand and repeat the chant for paragraph frames: "Paragraph frames are a tool to help me comprehend." Reiterate that learning challenging vocabulary from a story before reading the story and using paragraph frames as a tool after reading to recall information from the story can help us understand texts better. Call on a student to repeat the learning goal from today's lesson: "I can retell a fictional text with transition words using a paragraph frame." Ask students to rate themselves on how well they understand the learning goal with a thumbs up (I get it), thumb to the side (I'm still learning), and thumbs down (I need more practise). Explain that there are many tools and strategies we can use to help us become better readers. The story reminded me of a time when ____. Allow students to share their answers and use them as an assessment of how to continue teaching comprehension strategies to retell a story. 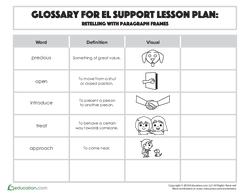 Use this glossary with the EL Support Lesson: Retelling with Paragraph Frames. 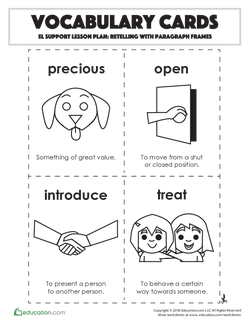 Use these vocabulary cards with the EL Support Lesson: Retelling with Paragraph Frames. Help your EL students retell a story using a paragraph frame and transition words. Use this paragraph frame worksheet to support ELs as they navigate through the process of retelling text using transition words. Help your students retell a simple fictional text using a paragraph frame for support! Ask your students to read the story about Ty's birthday, then answer the comprehension questions by retelling main events of the story on the lines provided. 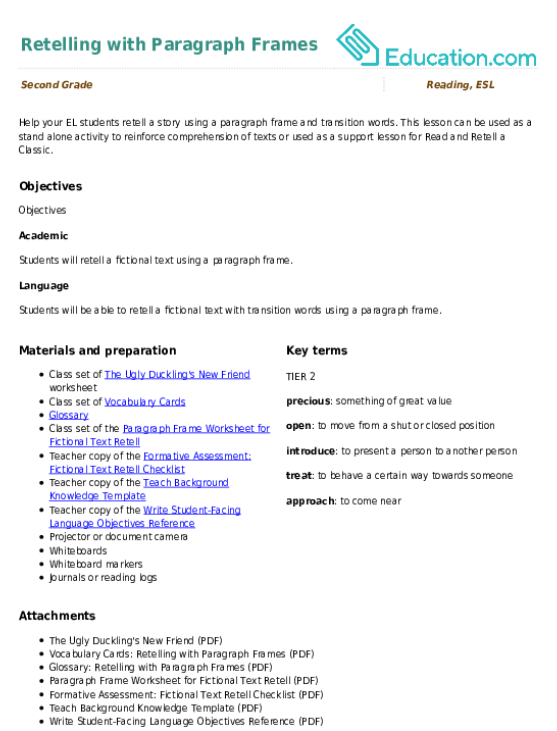 After reading a fable or folktale, students will use this cute graphic organizer to record the most important things that happened in the beginning, middle, and end. Then they'll try their hand at identifying the moral of the story. Take the monotony out of writing chapter summaries with this fun and creative alternative! Students practise retelling, identifying characters, and making connections. Budding writers will choose from the list of characters, settings, problems, and transition frames to help jump-start the creative process. 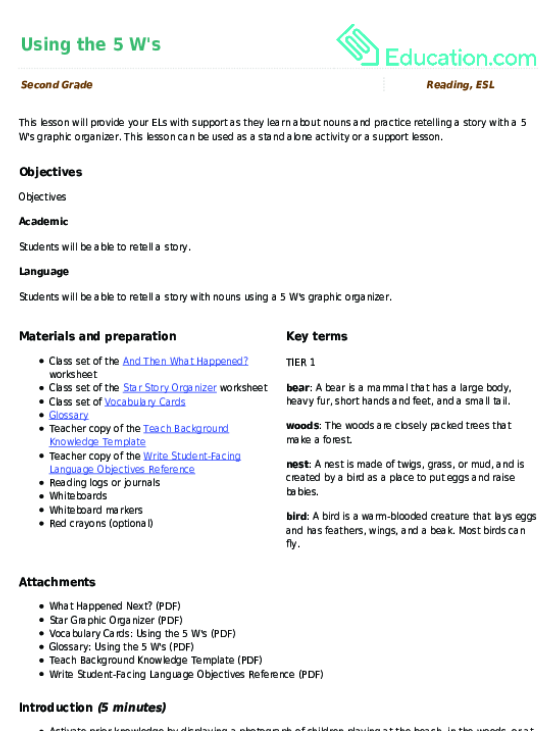 This lesson will provide your ELs with support as they learn about nouns and practise retelling a story with a 5 W's graphic organizer.